This sample marks penicillin's transition from an interesting phenomenon to a potential drug. In 1928 Alexander Fleming (1881-1955) discovered that a strain of Penicillium mould exuded a substance that killed certain bacteria. 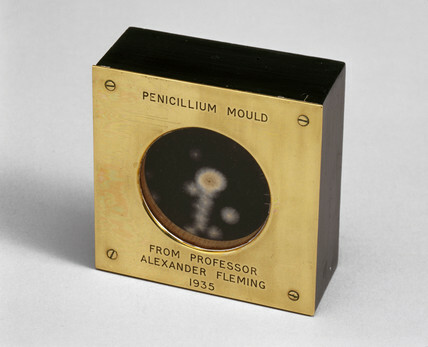 Following the German firm IG Farben's announcement of the first general purpose bacteria-killing drug Prontosil, Fleming now saw his 'penicillin', as he called it, as a posible medicine and gave this sample of a producing mould to a colleague at St Mary's Hospital in London. Penicillin was eventually isolated in 1940, and from 1942 became an important drug.